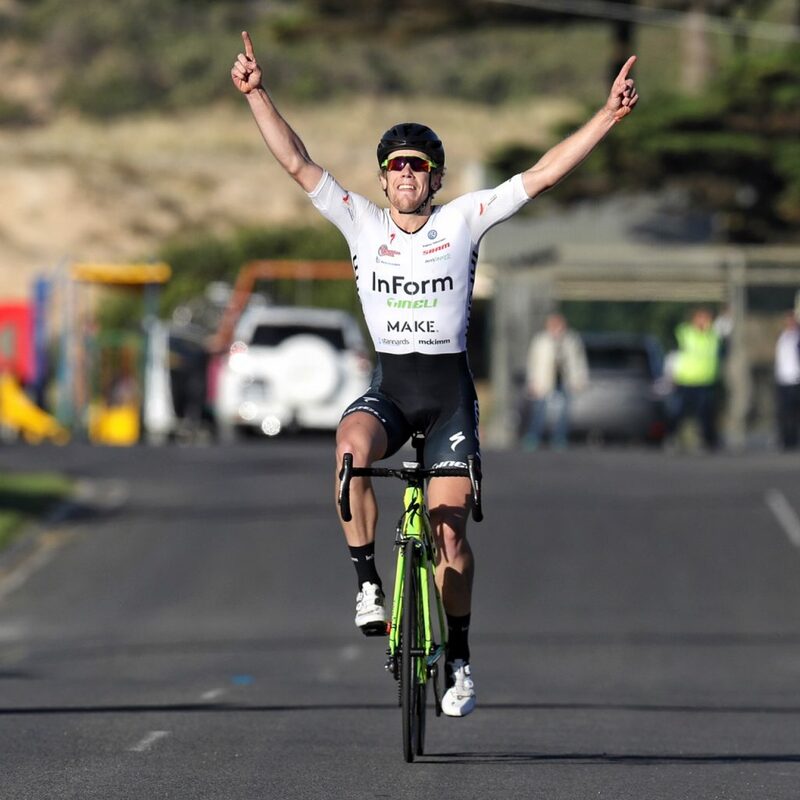 In this very first edition of “The Hollywood Hour” podcast, Lee is speaking with Cameron McKimm, team owner of InForm Make, a National Road Series team based in Melbourne, Australia. This article and podcast discussion outlines the motivation behind starting and developing a national road team, in addition to the challenges and opportunities that come with it. InForm Make have had a very respectable first season in the NRS. Not only have they developed juniors – with some already moving onto the international scene – they’ve also been highly competitive, recently celebrating their first NRS stage win at the Tour of Gippsland. 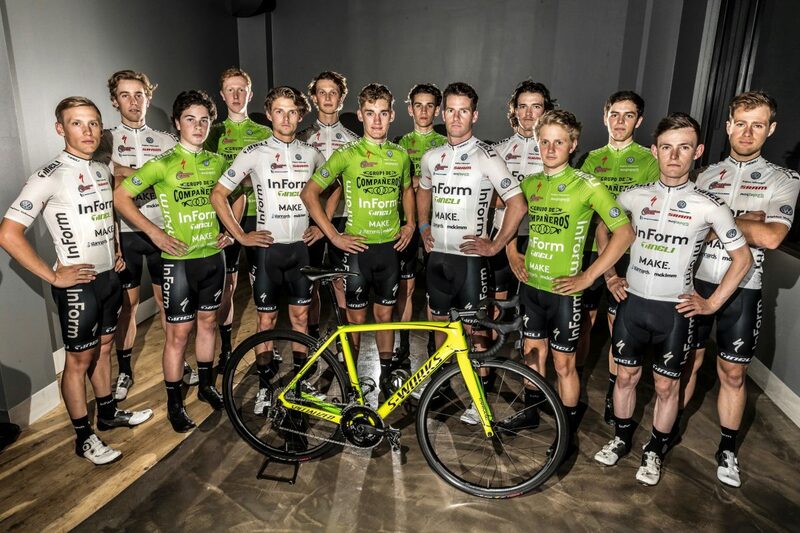 The rapid development and success of InForm Make – at both local and national levels – leads to a very insightful conversation about cycling team management and participation in the National Road Series. The conversation begins with Lee asking Cameron (Cam) about the previous weekend where InForm Tineli won their first stage of an NRS race. 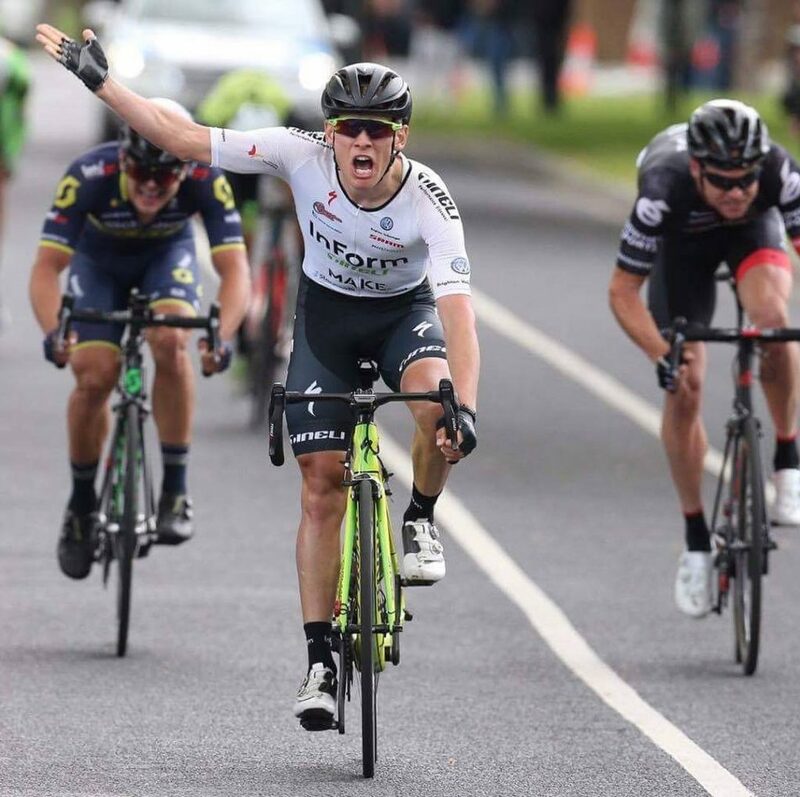 It was stage 4 of the Tour of Gippsland. Cam was out for lunch at a restaurant with his new girlfriend and her mother. It was the second time Cam had been introduced to his girlfriend’s mother and she wasn’t even aware that he had a cycling team. He had to explain why he was live streaming the race via Facebook on his phone during lunch! Cam describes how Sascha Bondarenko came across the line first, with dogged determination. Cam goes on to explain how they picked up Sascha. Cam’s brother Matt was watching Sascha roll repeated turns in Melbourne’s Saturday morning Hell Ride bunch. 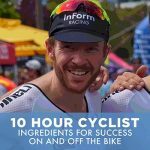 Matt approached Sascha – who had recently decided to leave behind a career as a triathlete and focus specifically on cycling – asking if he would be interested in exploring an opportunity with InForm. Cam then met with Sascha and offered him a position on the team less than 12 months ago. The rest in history. InForm Tineli rider Sascha Bondarenko crossing the line on stage 4 of the Tour of Gippsland. InForm Tineli’s first NRS stage win. Lee asks Cam what InForm does exactly – InForm designs and constructs new properties across the Melbourne area. Lee asks Cam how he ended up in cycling. Cam played football well into his twenties, but unfortunately broke his leg and ankle playing with the Old Brighton football team. The break was bad and he struggled to get back into running, setting him on a pathway into road cycling (thanks to a couple of friends of his, Bryan Scott and Scott Ginnivan). Lee asks Cam how the cycling hobby ended up with a desire to start a team. Cam spoke with Jason Nichols (a bike fitting expert based in Brighton, Victoria) when getting a bike fit. Cam was outlining the results he was getting in B grade with his desire to move into A grade in the local crits. Jason stressed to Cam that he needed help from other riders, and thus, the idea of team InForm was spawned. Cam talks about setting the standards and professionalism of the team from the outset, working closely with Hampton Cycles and also Specialized to get the team fitted out and representing out on the road. This was a foundational pillar for taking the team to the next level. As the amateur InForm team had momentum with sponsors and the team was starting to earn respect within the cycling community, it was a natural progression to at least consider an NRS team. Cam also saw the progression of juniors – such as Tom Jones – as a real motivator to keep the team going (following a decision to stop competing himself, while also managing an amateur team). Cam talks about the riders who have developed and are moving into other teams next year, where they’ll be provided with some higher level racing opportunities. Those riders include Tom Jones, Sascha Bondarenko and Paddy Burt. Lee asks Cam about the riders he’ll be picking up this coming season. They include, Pat Lane…Lee interrupts Cam – “Breaking news on The Hollywood Hour”. Cam and Lee go on to talk about Pat Lane and the value he will add to InForm Tineli. The conversation pivots back to juniors, discussing Carter Turnball and his development. He was in a break for 20 minutes at an NRS level race over the weekend at the Tour of Gippsland, at only 17 years of age. Cam talks about him as a brave young kid with a lot of race aggression. Cam talks about the progression of other riders in the team such as Lionel Mawditt, Tom McFarlane and Kallum Parlevliet (the SKCC Crit Champion). Ross Gordon had a bad year in terms of injury. He’s starting to “get up and about”, Cam explains. Stu Smith has been a great leader for the team and has just come off the first A grade criterium win for the team this season, taking out Glenvale honours. Cam talks about having 11 riders next year as part of InForm Tineli. Lee asks about all the riders matching perfectly with their kit and outfits. Cam says that the InForm brand is all about attention to detail and that’s how he wants the road team to be perceived. Lee asks about the different coloured InForm teams, with the green team as the under 19 development team, the white team as the NRS team and the blue team “are the washed-up older riders”. TM Insight have come on-board as the junior development under 19s team which will change the colour from green to orange for next season, matching the TM Insight brand colours. Last year (2016) Cam put a composite InForm team in the NRS when he found out there was a composite team available, and riders like Scott Sunderland. Luke Parker, Cam Bayly, and Shaun Cash were also utilised to help put this team together. Lee asks Cam what the first season goals were in the NRS. Cam wanted the boys to get experience riding at an NRS level and development juniors. Lee mentions that Cycling Australia (CA) have reached out to him to potentially have a three-way discussion, including Tommy Nankervis, to discuss the NRS topics that were raised in the previous podcast. Cam talks about the NRS. He believes CA have made some positive changes and it’s going to be improved next year with new formats, including the top 4 teams getting automatic entry into the Sun Tour. Cam outlines the picked up riders for next season, including Raf Freienstein, Jimmy Wheelan and Dave Williams. Cam talks about how the team get riders. Some are word of mouth, some guys send you applications and others you see out and about. Lee asks about how to approach sponsors. Cam talks about InForm picking up Toby Jillings as a team manager, who’s now responsible for managing relationships on a number of levels. Cam talks about his dad (Chris McKimm) and brother as great supporters for the team. Cam talks about selecting riders for each NRS race. Given riders have been injured and sick at different times, the provisional riders have fallen into place although next year they will need to be more set in stone given the volume of riders on the list. Cam talks about managing a team in the NRS as a “love thing” although there has been some brand gains for their business. Andrew Christie-Johnston is the grandfather of it all (NRS), Cam says. Cam talks about how they let Pat Lane go while giving him advice as he left the IsoWhey team. Cam spoke with Andrew earlier in the year and received the advice to always have the rider’s interest in mind, which is now how Cam approaches every decision that he makes with InForm. Lee asks about sponsors for next year – Kris Daff from Make Property Group has been a huge supporter of the team. Tineli are back on board, Posca, Stannards Accounting firm; suppliers and trade relationships through InForm will also support. Lee talks about the Shimano Super Crit last year and InForm bringing in the dream team, including Scott Sunderland. Cam talks about not bringing in external riders to get a win anymore, but only to help permanent InForm riders get a win. Next year InForm will have three paid resources to look after the team. Work and team life balance is a tough one to get right given the resourcing requirements to manage a team. Lee asks about riders getting paid. InForm will pay for travel and race entry but not salary for riders. Cam talks about Michael Drapac and what he’s done with his team, with the philosophy surrounding study and a blend of education and cycling being paramount. “Looking ahead to next year what are the plans?”, Lee asks. InForm will do the entire NRS, VRS and one race in Asia. Cam says Cycling Australia have been excellent recently, Kipp has been running discussions at events to collaborate with teams to get ideas for future improvements. The media side of the NRS is embarrassing though, according to Cam. No proper website or media channel is available. The Facebook live stream has been going well and is a step in the right direction. The main objective for next season is to finish in the top four so InForm Tineli can go “Conti” next year. Qualifying for Albert Park, Cadel’s Road Race and the Sun Tour. Cam talks about the circus state of the NRS given the different locations of the races, which makes it a real challenge for organisers. Lee asks if Dale Woonton will ever win an A grade criterium again? Cam thinks there’s going to be five strong teams in the NRS next season which will see a more engaging/competitive NRS. Cam and Lee talk about the Noosa criterium happening this coming weekend, with 20,000 people there, Matty Keenan commentating, and an electric atmosphere. Lee talks about the Bay Crits dropping off, with less people and less promotion. Lee hopes that with a year’s holiday they will come back bigger and better than ever. Lee wraps up by saying that he is personally excited and proud about InForm Tineli, the development of the team and the opportunities that riders now have under the InForm brand. Like this podcast? Subscribe to keep up to date with our latest releases. Cam McKimm you are an absolute credit to cycling development! Well Done. Thank you for this wonderful blog, now I have the knowledge on how to start a road team! This is kind of amazing! I love to join very soon or even make my team! Thank you for your informative blog!